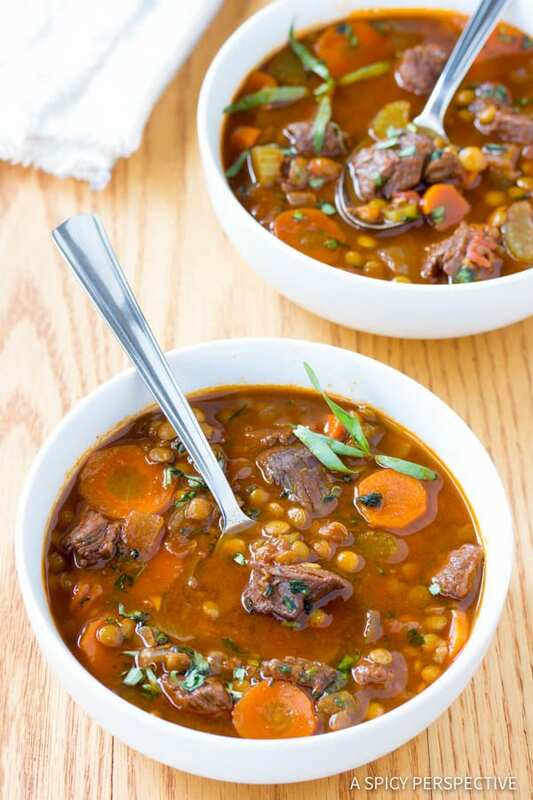 Our Beef and Lentil Stew is just the dish to fill and warm your belly this season! Stews remind me of my childhood… Of coming in from the blustering outdoors with ruby cheeks and a smile. Stew reminds me of shedding my gloves and scarf at our hall tree, then eagerly sitting around our family table for a filling meal. Stew reminds me of my mom, always smiling, always a wonderful cook, although she still won’t admit to it. Mom had a way of drawing us into the kitchen. She would make up funny stories about the origins of our food and allow us to whittle our fruits and veggies into amusing shapes. Even when life was hectic for her, she made our time together light, memorable, and full of teachable moments. If only I can make such an impact on my babies. 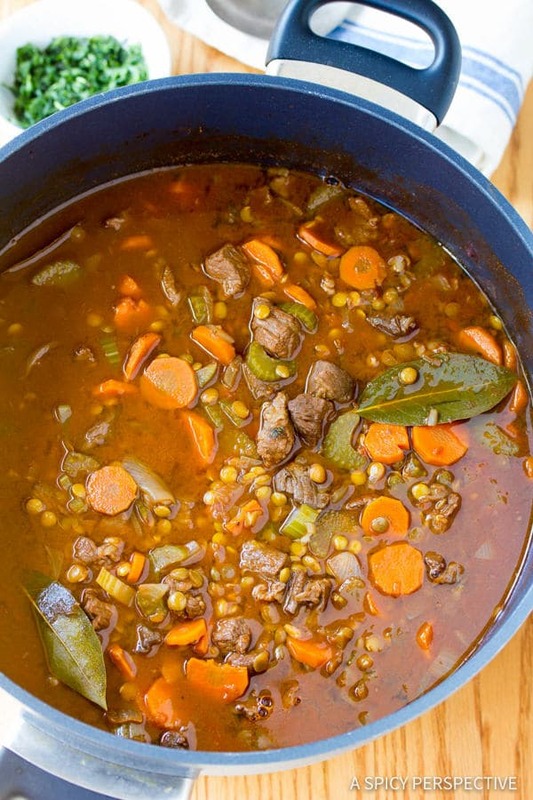 Today’s Beef and Lentil Stew is a true family favorite. It’s a play off my mom’s classic beef stew, substituting lentils for potatoes to enhance its nutritional value. Beef and Lentil Stew is a marvelous meal to warm you up on a winter’s day. It’s guilt free, gluten free, and fabulous as leftovers. 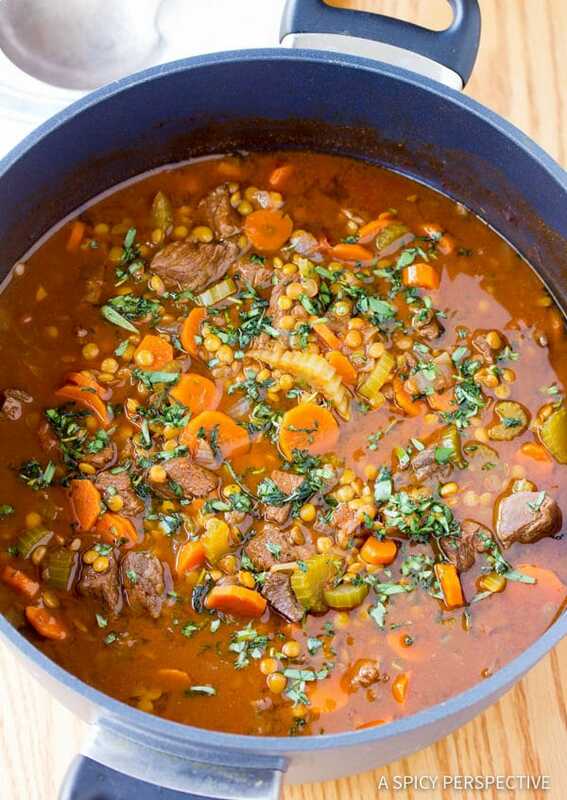 A rich and hearty Beef and Lentil Stew Recipe full of healthy ingredients. This nourishing stew is a perfect family meal for cold winter evenings. Heat the oil in a large pot over medium-high heat. Sauté the onions for 3-4 minutes, then add the beef and garlic. Brown the meat, stirring regularly, for 5-10 minutes. Add the carrots, celery, lentils, tomatoes, beef stock, wine, bay leaves, thyme, 1 tsp. salt and cayenne pepper. Bring to a boil, cover, then reduce heat and simmer for about 45-60 minutes, until the lentils are tender. Stir in the tarragon. Then taste for salt and pepper. NOTE: Use a pot with a heavy lid to keep in the heat. 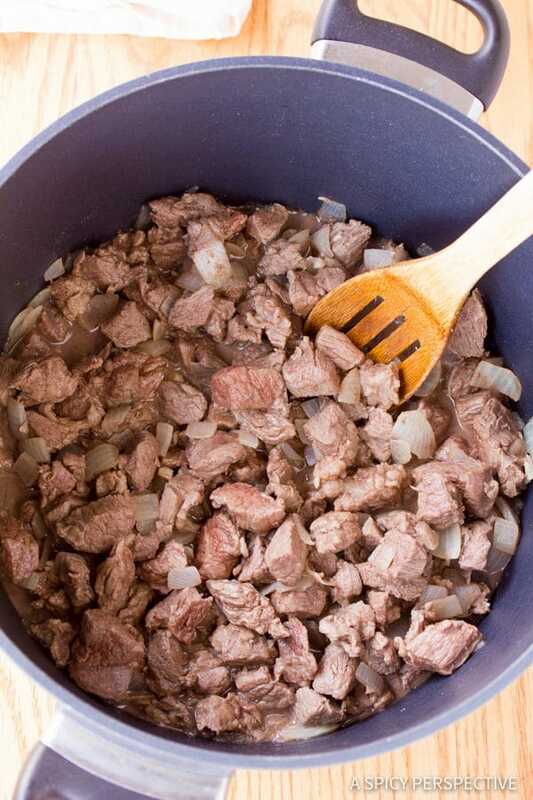 Otherwise you may have to cook the stew a bit longer for the meat to tenderize. I made this last night and it was my first time cooking with wine so I was very excited. It’s so good! I brought the leftovers to work today for lunch and all my coworkers kept commenting on how good it smells. I made this stew over the weekend and my husband said, “this is my favorite dish!” I live on the coast in Ca. and I have been waiting for the weather to change to start making things for dinner (other than salad and BBQ). Plenty of leftovers and every day it gets better. SO delicious, thank you! Can l use asparagus instead of celery??? Great recipe! Good proportions. Use lower end of the water for a heartier bite. At sea level with 6c of water 60 minutes was perfect. Can you make this is the crockpot instead? What a perfect warm soup perfect for these cold months!! Oh my! I am definitely trying this stew! What a wonderful recipe for cold winter months! I love this recipe and your explanation of how to properly prep. I’ve been doing the same stew for decades (spanish origin) and adding chorizo, tomato concentrate and some paprika for the some extra kick. Brilliant. Made this tonight as a compromise for the family. I am trying to reduce my meat and carb intake but the family loves traditional beef stew. I made this and everyone loved it! I simply scooped up mine avoiding the potatoes I added and only took a little bit of meat as a treat. It is very satisfying as a lentil stew. I did make this in the slow cooker. Ran it on low for about 5 hours and up to high for an additional two hours as the lentils were a bit firm yet. Also, I didn’t have any wine on hand so I substituted a can of Consomme. Delicious. I highly recommend! Going to PIN this one for future use. 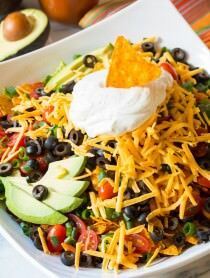 This deceptively simple recipe is DELICIOUS!!! It is my newest fave and will be a “go to” for busy work-weeks! Simply fantastic! Thank you for such wonderful recipes you share!!! I am going to try most of them as they look delicious and HOMEY. Thank goodness!! I just discovered this in my search for lentil soup recipes and it was fantastic! I did it in the crock pot on high for about six hours which gave the meat plenty of time to get tender and the lentils too. Everyone loved it, even my neighbor whom I gave a big bowl to. Perfect for a frigid winter night! Awesome! I cooked for two hours just to be sure meat was tender and it was! Next time, I’ll only use 1/2T thyme as 1T was a little too much for me. Thank you for sharing this recipe. It’s simmering on the stove top at the moment. The ONLY thing that I dislike about winter’s end is putting away all my soup and stew recipes. Apparently I don’t need to do that yet though, as winter seems to be holding on for a while this year. So I am glad to have some new things to try out as I patiently (not at all patiently) await spring. Oh geez, that looks good enough to eat well into summer, Sommer. Seriously. I never liked lentils when I was a kid and I don’t know why because I adore them now. This looks so, so very good. I always love to see you using “my” green pot! It matches your site design so well. This is my kind of meal. I love flavourful stews with such a variety of tastes and textures. So nutritious, delicious, economical and ultra satisfying. The photographs are incredible! 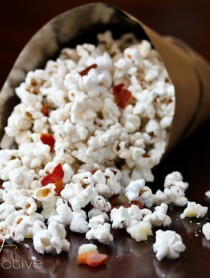 I am about to make this for the second time in two weeks. It’s delicious!!! Thank you! Lovely stew Sommer! Love that it’s not heavy on carbs. I have everything except the beef and this is looking better and better, the longer I look at it! This looks fabulous! Especially with the lentils and wine. Yum. My beef eating, country raised husband doesn’t care for stew oddly enough, he doesn’t like the mushy, blended flavors. I however love it. 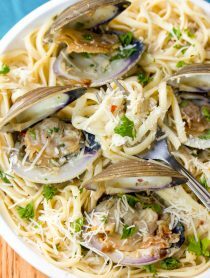 It is so comforting and hearty and flavorful. Not to mention simple and frugal! Im just going to have to try this because I love the ingredients in it! Your stew is just gorgeous. I love the combination of beef and lentils, it sounds amazing. :) Congrats on the Top 9! Lucky for me here in the warn Caribbean the seasons don’t dominate my eating so I can have this right now! This stew is gorgeous! I would probably eat it year-round. Congrats on making it to the Top 9. Ah your photos are making me drool! I made some beef stew today and told my hubz that it better be the last stew that I have to make… this winter is too darn long! 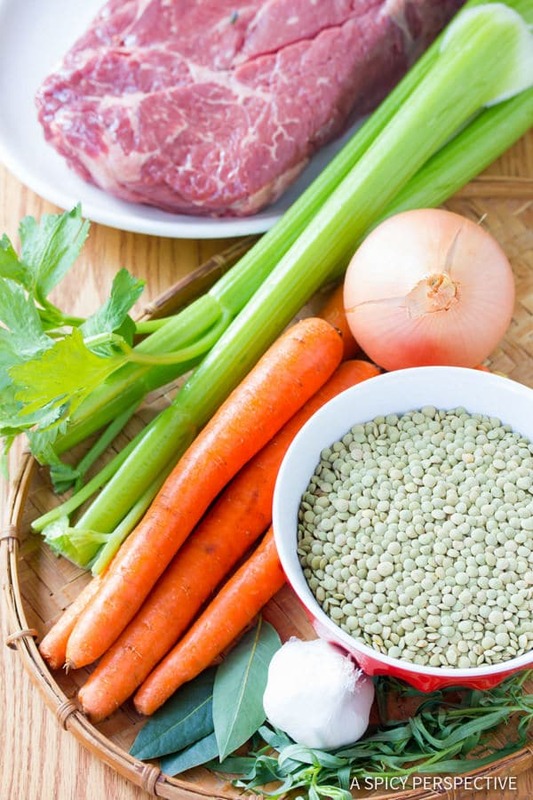 I have never used lentil in my beef stew…thank you for the tip! Sommer-love this stew! I make lentils often but I have never made them like this w/the beef as a stew. Looks amazing! I just had lentil stew for dinner! Great pics. I really like how you go step by step with the photos. Wow… this looks fabulous! Your photos make this look like a wonderful stew dream. I think the lentils would add a lovely earthiness to the stew. Made this last night and the flavor is good but the beef is way too tough after only 45 minutes of cooking. I shouldn’t have been surprised because none of my other stew type recipes call for a mere 45 minutes of cooking. I ended up pulling the lentils and veggies out of the broth and cooking the meat solo for another hour and a half until it was properly, meltingly tender. A quick recombine and heat through and it was perfect. Even better today. Sorry you had trouble with your beef! Did you cover it? That way the meat simmers and steams, so it softens faster. I’ve been making an absurd amount of stews and soups so that it lasts for days. May need to add this one to the line up! Always looking for new and delicious ways to make lentils. 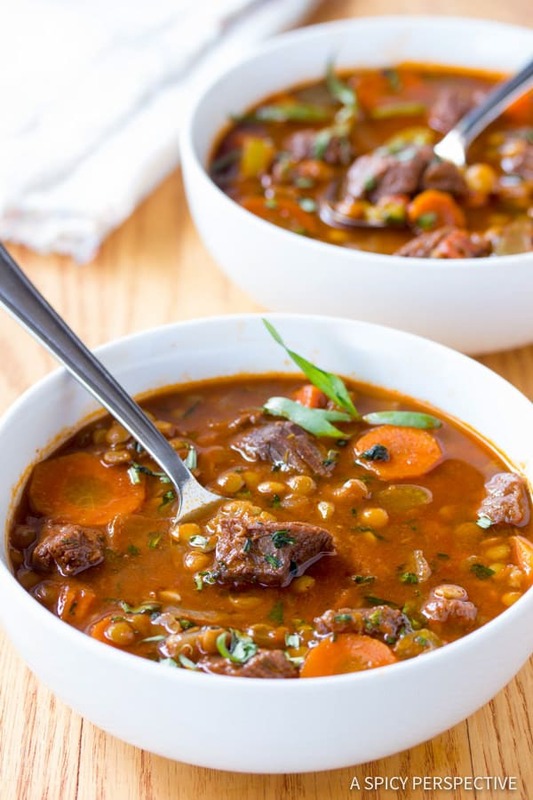 Sommer, what a hearty beef soup…and love the idea of lentil…I have to try this one. Looks delicious and very filing :-) Have a wonderful week! This would definitely make a fantastic comforting winter meal. It looks delicious! I never would have thought to put beef in a lentil stew but hey why not? Maybe I’m thinking of lentil soup and how good it is with a grilled cheese sandwich, now why does thinking about food distract me like that???? Ok, so now the challenge is, how can I sneak this in before spring hits. It looks lovely. What a good idea. I’m going to be a copy-cat. Love lentils – really what a grand idea. And there are a few more weeks of stew season – this just beckons. I wanted to thank you for your message, that truly meant so much to me. I love how the sun is capturing the still life perfectly, I really love stews, what I love most is they are hearty, pretty healthy, and I can get so many meals out of one pot. I just ordered a bag of lentils, I can’t wait to make this. I’m not a beef eater, but you sure can make it look good, Spicy! You have beautiful pictures on your blog. That dish looks so good. What a lovely variation on traditional stew. Adding lentils instead of potatoes sounds insanely good! My husband has been begging me to do make something with lentils. This looks/sounds perfect! I’d love a nice warm bowl of that stew right now! The best stew I ever made was on a woodstove. I let it simmer for hours and it turned out perfect. 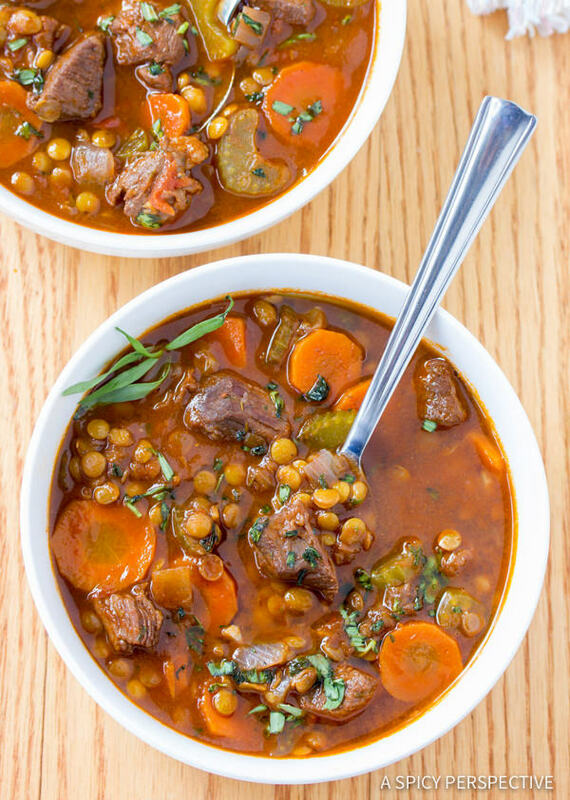 Love the addition of lentils…looks like the perfect stew! Yay for the last stew of the winter!! Stew reminds me of my childhood as well- mom’s chicken stew was certainly a favorite on cold nights! This one looks great, I’ll need to try it! oh it’s mid 80’s here, but I would still devour this entire bowl of gooodness….my girls love lentils and hubby enjoys a thick soup..thank you for sharing..have a great week!! the second pic is simply stunning , HUGS! It’s still bitter cold in my neck of the woods – warm and comforting stew like this are desired and welcome! It looks wonderful! Love your twist with the lentils. Oh Sommer! This is a beautiful stew, and I loved that you opted for lower carb lentils over potatoes. And you know, it almost sounds better that way?! Plus, your photos here are the jam! Very nice…! The stew is looking so warm and hearty. Loved the addition of lentils, it makes it more sumptuous… ! While that second picture certainly makes them look attractive, I can not be fooled. Lentils are evil. A hearty and comforting stew is always welcome! Love the addition of tarragon. This looks like the perfect stew for anytime of year! Love your photos too! 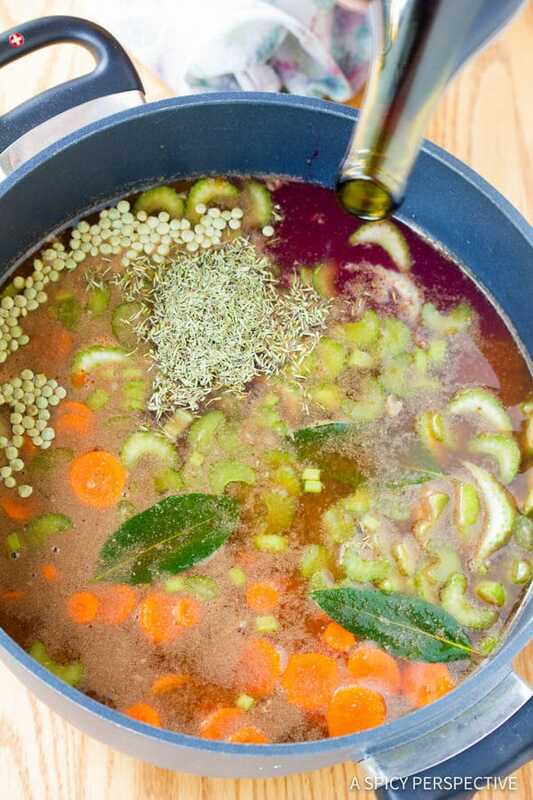 Sounds like a delicious stew for sure, very flavorful with the addition of tarragon! Winter will likely be sticking around a bit longer here in New England, so this stew recipe is a keeper! lots of lentils floating around these days … which is cool with me, cuz they’re practically free at the bulk section of Sunflower Market and they’re so easy to work with. cheers! As temperatures start to edge their way toward the 80s here in AZ, I am trying to get as much “winter food” made as I can. This sounds like a great hearty stew. I love using lentils to stretch the meat dollars! That looks really wonderful and hearty. I love lentil soup and this looks like a great way to use lentils. I’ve seen snow in June here in the Rocky Mountains, even though we have spring like days, my winter lingers a little to long sometimes. This stew looks wonderful and love your descritpion of the memories. I wanted to let you know that I made your Roasted Red Pepper Aioli this weekend. Delicious. Thanks for that recipe. Have you used the left overs on anything else? Besides the artichokes, can’t think of how to use the rest in just the right fashion. yum- this looks gorgeous! so hearty and yet healthy with the lentils. The broth on this stew looks so wonderful and rich. I like the healthy pour of red wine :) Since winter has not yet disappeared, I’m all for a hot bowl of beefy stew. I have a lentil black bean soup on the front burner for this week but your stew looks so much better! As always, your photos are wonderful! Wonderful soup – don’t think winter’s totally over just yet for many! Beautiful photos – so inviting…wait, are you inviting me over for some soup?